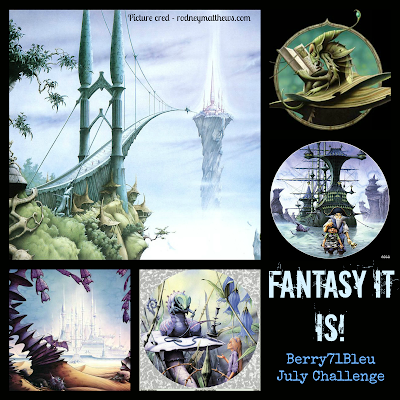 I´m hosting the Berry71Bleu Challenge this month and came up with the idea of making something about the Fantasy genre. Fantasy books are a passion of mine since I was a teenager, and the both of my kids follow my path. I have combined papers, die-cuts & tags from 7 Dots Studio Fortune Teller Collection with 7gypsies Ordre du jour papers. Loads of Tattered Angels Glimmer Mists (Verdigris, Dragonfly, Blue Bubbles) , Chalkboard Mists (Clover, Iron), Baseboard Mist (Wave,Sky) and Glimmer Glam (Turquoise) make the page really dreamy and sparkly. Love the Fortune teller cordinate badge from UmWow Studio, and the sentiment stickers works perfekt for this Project. I would love to see your entry for the July Berry71Bleu challenge! I have used Products form 7 Dots Studio, 7gypsies, Tattred Angles, UmWow Studio, Finnabair for Prima Marketing. Photo credit Au Contraire Photography.